Hey, remember that time Chevy loaned me a freaking sweet CAMARO during SXSW? That was awesome. I grew up driving a Chevy, and come this Thursday I'll get the opportunity to drive another Chevy again. Why? Well, because this city knows that if there's one thing I'm good at, it's having babies er, -- just kidding! -- it's shopping. Yours truly was invited to be one of the Austin "digerati" to participate in Chevy Shop Social. I'll be one of the shoppers / Chevy drivers for an amazing charity event this Thursday, June 5. Get this: I'll be given a $300 gift card courtesy of SheBuysCars.com, be put into a brand new Chevy, and I'll have two hours to spend said gift card in one of my favorite parts of town: The 2nd Street District, where I'll be buying goodies from local shops to be raffled off later that evening. 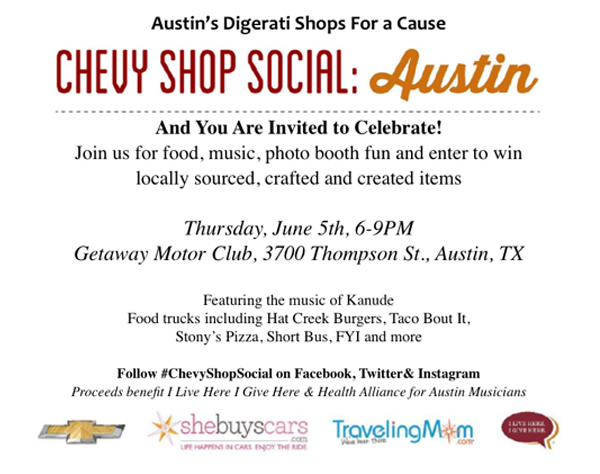 I'll be Instagramming my shopping frenzy via #ChevyShopSocial @indianaadams, and all the purchases (from all the influencers and bloggers) will be raffled off with the proceeds going to some amazing Austin charities. Here's my favorite part: raffle tickets for the prizes are just $1.00 each, meaning you could be walking away with a local treasure for just a buck! 100% of the proceeds benefit I Live Here I Give Here and HAAM. And bonus: Chevrolet is sponsoring the event and will be match all donation given that night, up to $5000. And guess what? You're invited to the big shin dig that evening and it's absolutely free to attend! In addition to the raffle, there will be food trucks (including Hat Creek! Mmmm, burgers...), live music, a Corvette photo booth, and a fleet of brand new Chevy vehicles to check out. I've been told that it will be family friendly, so my whole brood will be there. I would love for you to join us. It's going to be a great way to get out to enjoy the the city and to support some deserving local charities. Plus I hear that the host venue, Getaway Motor Club, is pretty cool, too. Not local to Austin? No worries. Be sure to follow our #ChevyShopSocial hashtag on Instagram, Twitter, and Facebook to keep up with our adventure. For more information, check out SheBuysCars.com, the generous sponsor of this great event.